I wish I could start this post by telling you I'm one of those full-time freelancer/blogger geniuses, writing for you from beneath my covers with a steamy cup of delicious coffee at my fingertips, the dog curled up by feet, and the calendar declaring this is a typical weekday afternoon for me, but unfortunately, I can't. I work a 40 hour work week like anyone else, but my dream is to one day be a full-time photographer and writer, working from home, and living every moment in the pursuit of creativity. Don't get me wrong, I firmly believe that you can be creative if you're not working from home. In fact, my current 9-5 job is a breeding ground for creativity. Creativity is a trait that cannot be confined to one little corner of your life. It's infectious, inspiring, and it spreads like wildfire through you and to those you meet. I've had many creative ups and downs, and a lot of those 'ups' were illusions: things I thought were going right, but ended up being so wrong, at least for me. I want to share my story with you in the hopes that you can find comfort in knowing you're not alone in this. It took me 5 years after graduating from college before I found a job in my field, and I'm not even starting this story at the beginning of those 5 years because you'd be here for hours as I walked you through my life as a coffee barista, college English tutor, online tutor, insurance company representative, photography student, and unpaid photography intern (twice). I'm starting at year 3 in which the realization that I was meant for something more started to slowly - and I mean slowly - sink in. If you're an English major, you know the struggle all too well, and if you have a good work ethic, you'll take anything that's offered to you. That's what happened when I took a job at a well-known gas station corporation's warehouse. It was a temp position, and with a husband in grad school, I was desperate for work. The temp agency told me it would be a job in which I could use my brain: data entry. Light office work. You know, English major stuff. Turns out this gas station corporation collected all the bachelor-degree holding temps they could find, corralled us into a room, and told us to sort dirty, grimy, used coupons into piles. Like a deck of cards. Why? They needed to weigh them. Because weighing them would tell them how much they lost on coupons. Needless to say, A LOT of people walked out and never came back. I stuck it out anyway, and I sorted coupons like nobody's business, and suffered a ridiculously violent cold which I can only attribute to the awful, gross, used coupons I was touching everyday. Eventually, I convinced myself that the only way I'd survive this temp assignment is if I actively looked for employment elsewhere. So I started looking at nanny jobs. Yes, I convinced myself that nannying would be the only way I could redeem myself. I had a bachelor's degree in creative writing and magazine journalism. I went to school for photography as well, and I started my own photography business, which meant when I looked at myself, I saw someone who had acquired skills not worthy of compensation. I was a full-time nanny for a year before I started to realize I was meant for something different. I was extremely fortunate as a nanny. I loved the children, they loved me, and I was paid well, but coloring and ballet practice and gluten-free cupcakes wasn't how I pictured my mid-twenties. In fact, I was depressed, and considered giving up photography for good. People either wanted my work for free, or were willing to hire someone with poor work for a better price. I felt disrespected as an artist, and I became bitter. This was also the time when I realized that I didn't like shooting weddings and portraits. I didn't want to be a photographer like every other photographer. I realized I wanted to help bloggers, makers, writers, and designers make it in their industry because gosh, I was meeting so many of them with similar struggles as me, and we were connecting and bonding, and encouraging one another to create. 5 years later, I can officially say I not only have a full-time position in my field as an English major that also allows me to fully use my photography skills, but I'm still transforming my own vision as a photographer for creatives. I'm writing and photographing and flat out creating and it's amazing. As bloggers, we're not all going to become celebrities, best-selling authors, or the next Anthropologie founder, and that's ok. As creatives, we're content to create for a purpose that doesn't have to follow a certain formula. We create for intention and community and expression. 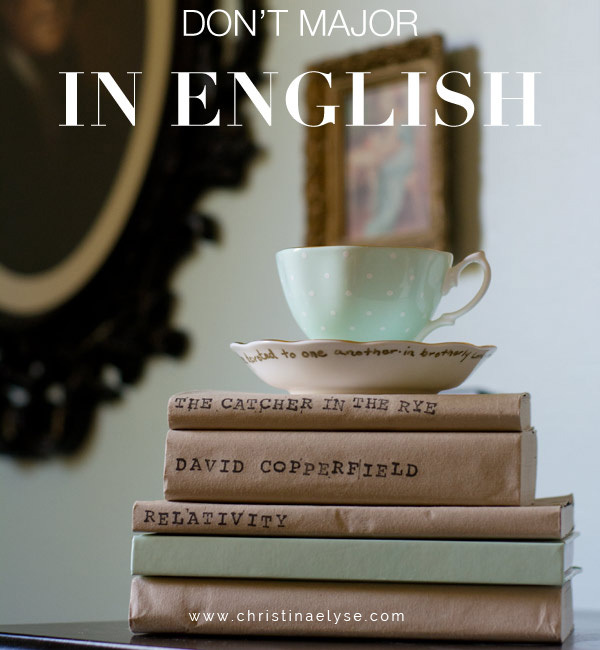 It's ok to Major in English.